How do instruments end up on satellites orbiting the Earth? For many of them, long before they are ever launched into space, they are tested from NASA airplanes. 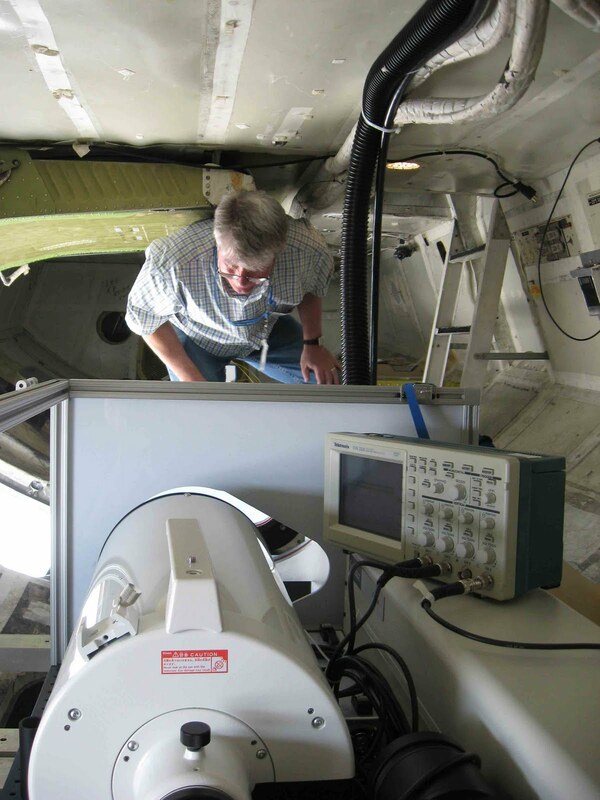 One of the objectives of the NASA Airborne Science Program is to test new instruments in space-like environments. Testing future satellite instruments from airplanes is the next best thing to actually testing them in space. 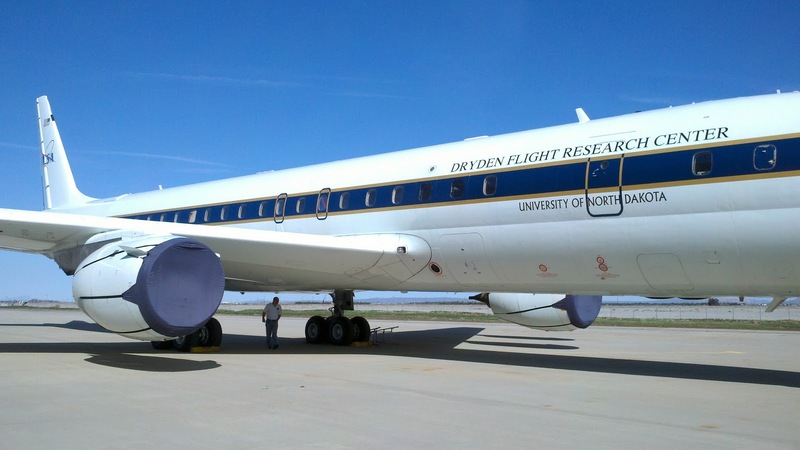 Over the past three weeks, a team from the Goddard Space Flight Center led by Bill Heaps has been testing an instrument on the NASA DC-8 that they hope will fly on the ASCENDS satellite mission. ASCENDS (Active Sensing of Carbon dioxide Emissions over Nights Days and Seasons) is an upcoming NASA satellite expected to be launched in 2018-2020. The goal of ASCENDS is to measure the sources, distribution, and variations in carbon dioxide gas to a very high precision all over the Earth. Mapping carbon dioxide is important for understanding the global carbon cycle and for modeling global climate change. How do you measure carbon dioxide from space? Carbon dioxide makes up a very small fraction of the gas in Earth’s atmosphere. In addition, the majority of the carbon dioxide variability occurs in the first hundred feet above the surface of the Earth. In order to measure the abundance of carbon dioxide from a satellite, any instrument must therefore look through Earth’s entire atmosphere in order to detect the variations in carbon dioxide occurring near the surface. Heaps’ instrument, a broadband Lidar, uses an infrared laser beam aimed at the surface of the Earth. As the laser passes through the atmosphere and bounces off of the ground, carbon dioxide molecules in the atmosphere absorb some of the light from the laser. 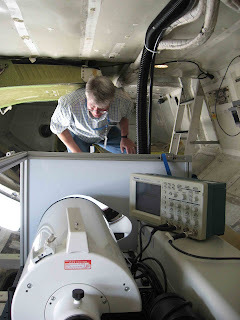 Measuring the amount of absorption that occurs as the instrument passes over different locations on the Earth will allow the team to build global carbon dioxide maps. Typical Lidar systems have lasers that emit light at very specific colors (wavelengths). The broadband laser used in Heaps’ instrument emits light with a broader range of wavelengths. The carbon dioxide molecule absorbs light at a several different infrared wavelengths. A broadband Lidar, therefore, has the advantage of being able to detect carbon dioxide absorption in multiple wavelength bands with one laser. The wavelength control requirements are also less strict than for a more conventional narrowband laser, which may make the system easier to implement on a satellite. 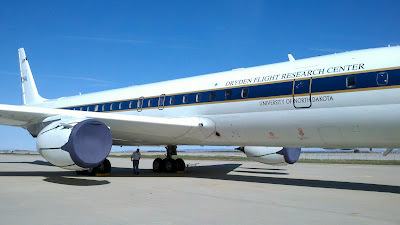 The Goddard team worked for over two weeks to install and test their instrument on the DC-8 on the ground at the NASA Dryden Aircraft Operations Facility in Palmdale, California. This week, the team flew with their instrument on two, four-hour flights on the DC-8. During the flights, they tested the instrument performance at variety of altitudes and over different types of surfaces (deserts, agricultural fields, mountainous terrain, the ocean, and the flat waters of Lake Tahoe). The team was very pleased with the performance of the instrument. “The system definitely measured CO2 on both flights even transmitting a very small amount of laser power. I believe the broadband technique has excellent potential to be scaled up for measurements from space,” Heaps said. DC-8 flight track (in red) from Wednesday May 4, 2011. During the four-hour flight, the Broadband Lidar Instrument was tested at variety of altitudes and over a variety of different surface terrains. This July, several instrument teams all vying to be chosen to fly on ASCENDS will test their instruments side by side on the DC-8. With data from the test flights of the Broadband Lidar Instrument in hand, Heaps’ team will return to Goddard to make refinements and improvements in the hope that their instrument will be chosen to fly on the ASCENDS satellite mission. Funding for the Goddard Broadband Lidar was provided by the NASA Earth Science Technology Office Instrument Incubator program.